This short work is important because it may be the boldest and most direct statement of Kierkegaard's position on the church and Christianity. The expression "armed neutrality" was a political term, as Hong writes, and "was used initially in international political life in 1780, when Denmark, Norway and Russia, and subsequently Sweden, entered into an agreement in Copenhagen for the defence of their rights against the great powers, England in particular". 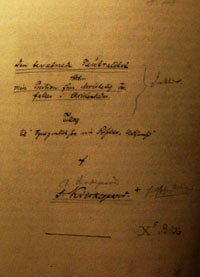 Kierkegaard also used the expression in 1838 in a journal entry. He originally intended to publish under his own name a periodical entitled Armed Neutrality, to address the current state of Christendom. He later gave up this idea, as well as any plan of publishing the work separately. It was not published until 1880 in Efterladte Papirer. Kierkegaard wrote Armed Neutrality at the time he was writing The Point of View for My Work as an Author, which he also left unpublished. Instead he published the brief On My Work As An Author. Armed Neutrality is in a sense more direct than the so-called Attack Upon Christendom because Kierkegaard does not use hyperbole, but speaks calmly—albeit forthrightly. For the attack on the church see Articles from the Fatherland. Kierkegaard speaks about himself, clearly stating his purpose from the beginning. By this phrase "armed neutrality," especially as I get it defined more and more precisely, I believe I am able to characterize the position I intend to take and have taken in illuminating Christianity, or what Christianity is, or, more accurately, what is involved in being a Christian. Naturally, it cannot mean that I want to leave undecided the question of whether or not I myself am a Christian, am pursuing it, am fighting for it, praying about it, and hoping before God that I am that. What I have wanted to prevent and want to prevent now is any sort of impression that I am a Christian to any extraordinary degree, a remarkable kind of Christian. This I have wished to prevent and still wish to prevent. What I have wanted to achieve and still want to achieve through my work, what I still regard as of utmost importance, is first of all to get clarified what is involved in being a Christian, to present a picture of a Christian in all its ideality—that is, the true form and stature worked out to the very last detail, submitting myself before all others to judgment by this picture, whatever the judgment is, or, more accurately, precisely this judgment—that I do not resemble the picture. Kierkegaard states here, what he would return to in his attack upon the church, that the Christianity of the New Testament ceases to exist, is "completely abolished". It still exists in some sense, but only "as a teaching, as doctrine". What has been abolished and forgotten, however, (and this can be said without exaggeration), is existing as a Christian, what it means to be Christian; what has been lost, what is no longer present, so to speak, is the ideal picture of what it is to be a Christian. As evidence that Christianity does not exist is the fact that the church is established, is the establishment, whereas the Christianity of the New Testament came into being in opposition to the secular and religious establishments. Kierkegaard then explains his particular task as an author. Therefore my task is and has been to present in every way the ideal picture of being a Christian: dialectically, pathetically (in the various forms of pathos), and in terms of an understanding of man, modernized by constant reference to modern Christendom and to the errors of a scientific-scholarly outlook. Jesus Christ himself, of course, is the prototype and will continue to be that, unchanged until the end. But Christ is also much more than the prototype; he is the object of faith. Again, Kierkegaard returns to the claim that he in no way claims to be a prime example of what a Christian ought to be. In the earlier pseudonymous work, Concluding Unscientific Postscript, Kierkegaard's pseudonym Johannes Climacus claimed not to be a Christian. Later Kierkegaard used the pseudonym Anti-Climacus to represent the ideal Christian, though he listed himself as editor. This was Kierkegaard's way of approving of Christianity without idealizing himself. He addresses his place in Christianity and the role of martyrdom. Humble before God, knowing what I do of what it really means truly to be a Christian, and knowing myself as I do, I dare not in any way maintain that I am a Christian in any outstanding way or permit any differentiating accent to fall on my being Christian; for example, I would not dare, particularly not in Christendom, to expose myself to becoming a martyr, to being persecuted, to losing my life because I am a Christian. Do not pass premature judgment on what I am saying but rather take time to understand it.... I hope before God that I am a Christian, and believe that out of grace he will accept me as a Christian.... I am not afraid of being killed—although I by no means flaunt a willingness for it nor am I eager for it.... What I do fear is what my death would come to signify through what I say about myself. In other words, I am not afraid of dying, but I am afraid of saying too much about myself.... Obviously it is not my intention...to abolish martyrs or to make martyrdom an impossibility.... Generally, the fact is overlooked that martyrdom is in the category of freedom, that it is not "the others" who have the martyr in their power but it is the martyr who has them in his power. This statement is in some sense a reversal of a position he held two years earlier, which he expressed in "Has a Man the Right to Let Himself Be Put to Death for the Truth?" (see Two Minor Ethical-Religious Essays). There he was concerned about the effect of the martyr's death on his persecutor. With remarkable frankness Kierkegaard returns to his role as author, and specifically author of Armed Neutrality. Kierkegaard then explains the meaning of the title of the work. Armed Neutrality. If I were involved with pagans, I could not be neutral; then in opposition to them I should have to say that I am Christian. But I am living in Christendom among Christians or among men who all claim to be Christians. It is not up to me, a man, to judge others, particularly not in the role of one who knows men's hearts, which here would have to be the case. Now if I were to insist that I am a Christian, what would this mean in the situation? It would mean that I am a Christian in contrast to Christians—that is, that I am a Christian raised to the second power, the outstanding Christian. This is why I maintain neutrality in regard to my being Christian.... And so I work at portraying the Christian ideal. In order to do it, I must have this neutrality.... The task, then, is to portray the ideal Christian, and this is where I propose to do battle. That Kierkegaard was "armed" with an immense intelligence and with marvellous literary abilities, few would deny. But his position of neutrality is puzzling. If he were among pagans he would not be neutral, but among so-called Christians, he remains neutral. If he did not remain neutral he felt he would be vaunting himself as an idealized Christian. However strange his terminology may seem, he was not neutral in the sense of taking no position at all. So what does neutrality mean? This is my idea of the judgment which I believe is going to fall upon Christendom; not that I or any single individual shall judge others, but the ideal picture of what it is to be a Christian will judge me and everyone who permits himself to be judged. Kierkegaard considered himself "neutral" because he himself did not judge others. That is the task of idealized Christianity. His role was important, but it was not as judge. As opposed to the hyperbole of his later attack, his writing here is calm and modest. He is no ideal Christian. He will be judged too. It is completely accidental that I am the one who has the task of portraying this picture. But someone has to do it. Nowadays one becomes an author not through one's originality but by reading. One becomes a human being by aping others. That one is human is known not from one's own case but by inference: one is like the others, therefore one is a human. God knows whether any of us are! And in our age, when one has doubted and doubts everything, no one stops to think of this doubt. God knows whether any of us is a human! (Journals, X 1 A 666) .